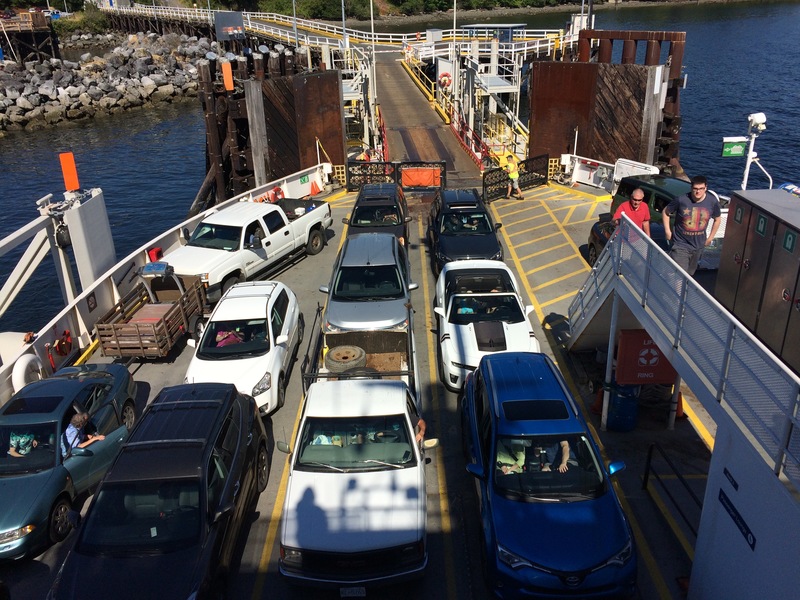 If you take the Crofton ferry to Saturday Market on Salt Spring Island for the day, the only thing more fun would be if you never had to go home. We just missed the 8:45, so we parked our car in the line-up and took a stroll along the boardwalk adjacent to the wharf. We passed a number of people, several alone, and some with a companion, and these complete strangers inevitably greeted us with a pleasant hello. Some made witty comments in passing, while others stopped to ask where we were from and what our experiences had been during our visit to Vancouver Island, offering suggestions for places they particularly enjoyed. Truly, that sort of civility sets the citizens of Vancouver Island apart. We had learned earlier about the remarkable number of volunteer hours gifted by individuals to local projects, but I think the origin of volunteerism has to begin with genuine interpersonal interest. I’d like to investigate how that sort of a culture is propagated. Another advantage of missing the early ferry is in having the time to view the marina, which in this case included seeing how logs are loaded onto a freight ferry. Just in case you’ve never lived on an island before, this is a birds-eye view of the kind of ferries that regularly run between the Gulf Islands in the Strait of Georgia that separates Vancouver Island from mainland British Columbia. The ferry that runs from Port Angeles to Victoria has to cross a greater distance and is significantly larger, but the loading technique is about the same. Our destination was the weekly Saturday Market in the Park, meaning the Centennial Park in Ganges Village. Open 9 AM to 4 PM every Saturday from early April to late October. We happened to find some homemade pastries that were simply divine, followed by some moderately disappointing rice with curry sauce. While we ate, we indulged in some people-watching in the park, which is never disappointing. 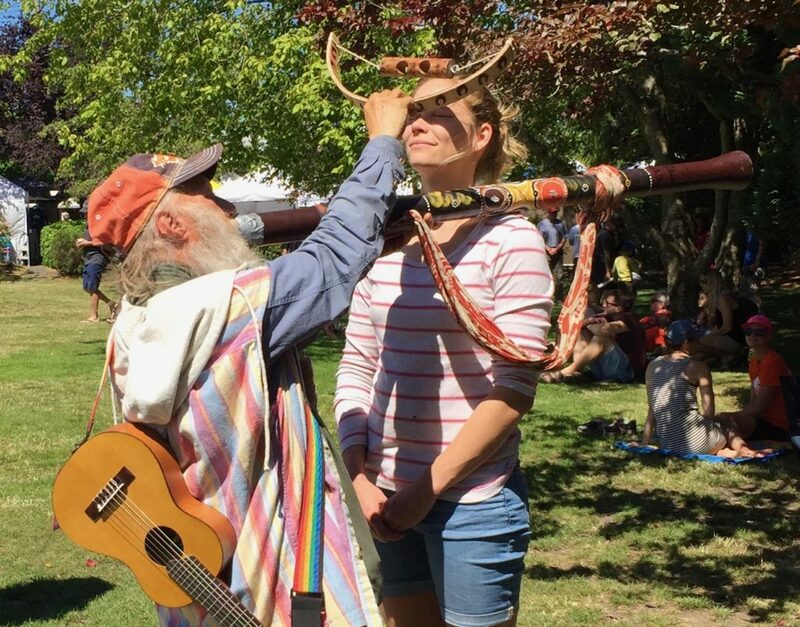 As nearly as I could make out, this elderly fellow would blow on his didgeridoo while shaking a rattle with spinning beads around the head of his client whose eyes were shut. I heard the young woman claim she saw various colours and dots as he did so. I’m curious as to what was intended for the end result of this shaman-like experience. Actually, I wanted to see what it was like for myself, but we’d spent most of our cash on lunch and the man didn’t look like he’d accept plastic. Not sure if I was denied or saved from a unique experience. 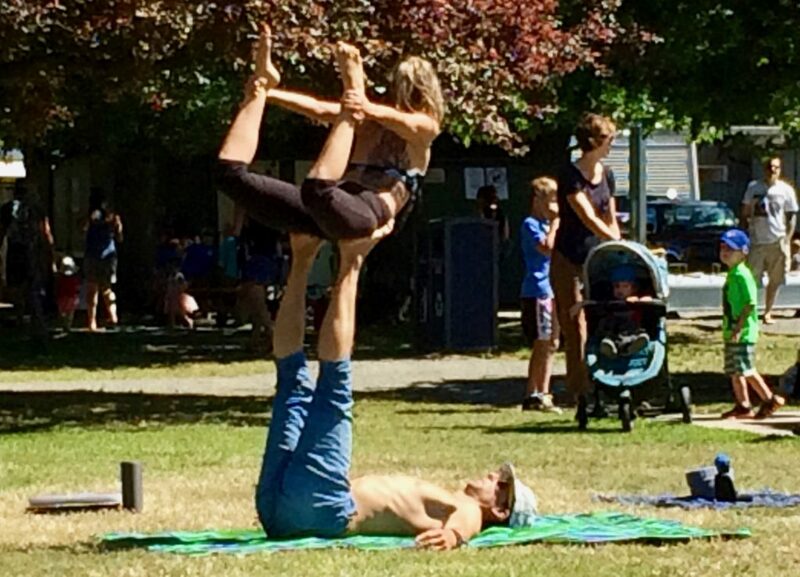 Meanwhile, a couple were doing acro-yoga on the grass, a combination of yoga poses with acrobatics. He laid on his back with both feet up at a right angle, and she balanced various parts of her body on his feet in difficult and beautiful shapes, moving fluidly from one to another without touching the ground. While indulging in a really good ice cream cone on an outdoor picnic bench, a chatty couple nearby struck up a conversation with us about their decision to sell their condo in Canmore, Alberta, and buy on Salt Spring. Just then another couple came by and joined in about an excellent potter who was having her semi-annual sale this weekend. See what I mean about open and friendly people? So, we drove south down the island to find the gallery of Pat Webber, which turned out to be up a rather steep narrow hill. Along the way we decided that we really did need a tea-pot if she had any. 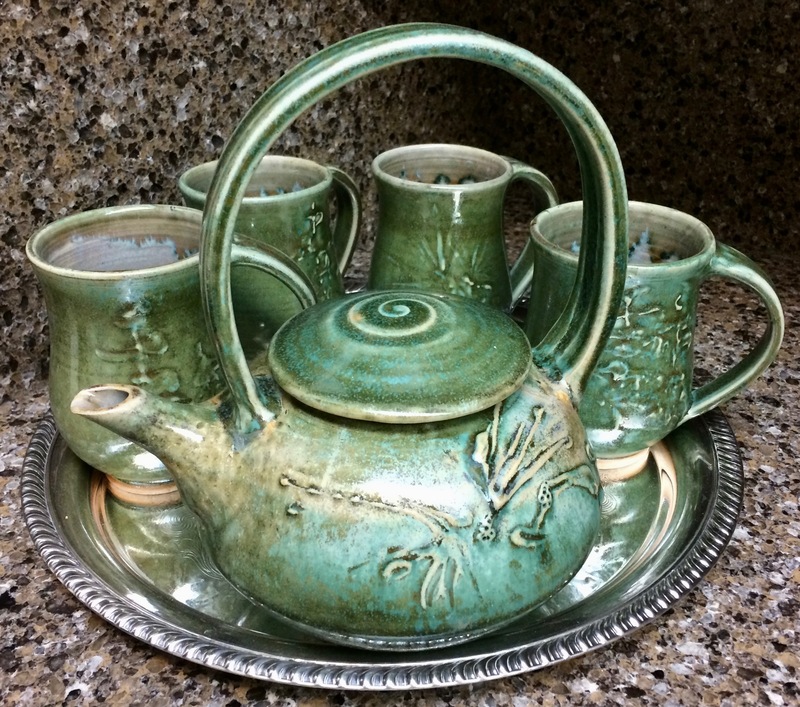 We left with the beautiful green tea-pot and cups above. 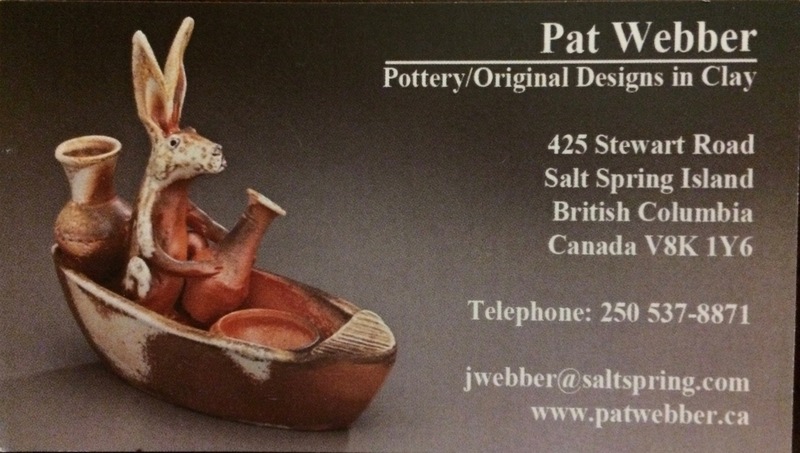 Her two rooms full of pottery revealed a woman with such remarkable skills that I’m glad she has a website where I can browse. Our next search was for the farm that sold dozens of kinds of goat cheese, reputed to be very delicious. When we found Salt Spring Island Cheese, we learned that the goats were now located elsewhere, but we got to watch a few chickens taking a dust bath. If you’ve never seen them do it, it’s rather entertaining. Well, we thoroughly enjoyed tasting quite a few kinds of goat cheese and then purchased some for our hostess in Nanoose. In short, dear reader, Salt Spring Island is a haven for artists, sculptors, musicians, craftsmen of all sorts, and small farmers who create boutique delicacies. If you want a one-of-a-kind anything, Salt Spring Island will most likely have the artisan to create it.